Worthington City Hall is located at 6550 North High Street, Worthington, OH 43085; phone: 614-786-7347. Photo: High Street on Christmas Day, 2010, photographed by user:Nyttend, en.wikipedia.com, accessed August, 2011. Worthington is important to the history of central Ohio for a variety of reasons. Its early platting and settlement (1803-4) resulted in its introduction of several important social and religious institutions into the state; and its proximity to Columbus, the state capital since 1813, made Worthington a prominent early commercial center with a number of taverns and inns. The New England heritage of the community brought several distinctive elements to central Ohio, in particular, its central public green, early manufacturing elements and its agricultural tradition of living within the community and farming the adjacent land. Finally, although a fairly wide range of styles are present in the community, a significant portion of the historic architecture of Worthington dates from the early 19th century. 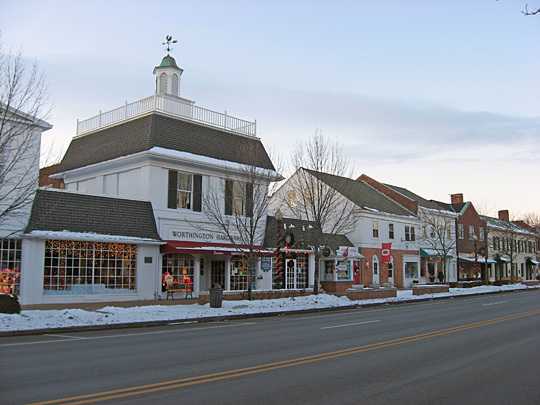 Worthington developed into a fair sized community early in the 19th century by virtue of its location on a major north-south overland route to the nearby state capital of Columbus to the south. As other communities were established in central Ohio, Worthington lost its earlier prominence and its growth slowly and drastically through the 2nd half of the 19th century. The 20th century development of the community is primarily a reflection of Columbus' growth and subsequent northward urban sprawl leading to the vision of Worthington as a pleasant suburban residential environment. This line of development can be clearly seen today in the physical environment of Worthington. The antebellum growth never completely filled the original 1803 plat and there were relatively few late 19th century subdivisions, so that there is a narrow body of early 20th century properties ringing the perimeter of the original plat. This contrasts starkly with the tract housing subdivisions that dramatically increased the size of the community in the 1960s and 70s and now surround the original plat. Thus, the majority of properties are the physical reflections of the early 19th century development. Worthington was founded by the Scioto Company, organized in Granby, Connecticut, and led by James Kilbourn, as a haven for Episcopalians desiring an escape from the political and religious ostracism in Congregationalist Connecticut. This strong religious heritage was also reflected in the prominence of Worthington as an abolitionist center. Other religions soon followed the Episcopalians with the establishment of a Methodist congregation in 1811 and a Presbyterian in 1816. The Methodists were active in early educational pursuits organizing the first authorized Methodist Church female seminary in the state, the Worthington Female Seminary. Many of the original settlers who came with James Kilbourn were Masons, so the establishment of a fraternal lodge and temple were early orders of business. In fact, the New England Lodge is the oldest Masonic temple west of the Alleghenies. David A. Simmons, Historian, Ohio Historic Preservation Office, Worthington Multiple Resource Area, Franklin County, OH, nomination document, 1979, National Park Service, National Register of Historic Places, Washington, D.C.